Shop online for 30 model-car-garage plastic models at discounts up to 47%. 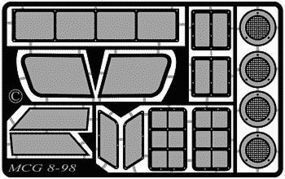 This is the 1/24 Scale Plastic Model Vehicle Accessory Kit of the Chevy Race Truck Spoiler for Revell/Monogram Chevrolet Race Truck kits (Photo Etch) by Model Car Garage. This is the 1/24-1/25 Scale Plastic Model Vehicle Accessory Kit of the Tuner Custom Billet Wings Slick Shooter .015 Nickel Silver (Photo Etch) by Model Car Garage. This is the 1/24 Scale Plastic Model Vehicle Accessory Kit of the 1998 Pontiac Grand Prix Grille & Duct Works (Photo Etch) by Model Car Garage. This is the 1/24-1/25 Scale Plastic Model Vehicle Accessory Kit of the Valdez Billet Style Steering Wheel (2 Pewter Rims & Photo Etch) by Model Car Garage. This is the 1/24 Scale Plastic Model Vehicle Accessory Kit of the 1998 Monte Carlo Grille & Duct Works (Photo Etch) by Model Car Garage. This is the 1/25 Scale Plastic Model Vehicle Accessory Kit of the Ford Custom Billet Style Truck Grille Fire Demon for RMX Ford F-150 Pickup (Photo Etch) by Model Car Garage. This is the 1/25 Scale Plastic Model Vehicle Accessory Kit of the Chevy Custom Billet Style Truck Grille Baroque for RMX Chevy Silverado (Photo Etch) by Model Car Garage. 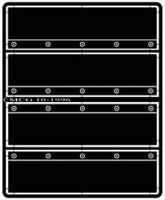 This is the 1/25 Scale Plastic Model Vehicle Accessory Kit of the Chevy Custom Billet Style Truck Grille Fire Demon for RMX Chevy Silverado (Photo Etch) by Model Car Garage. This is the 1/24-1/25 Scale Plastic Model Vehicle Accessory Kit of the Stock Car Front Airdam Spoiler (Photo Etch) by Model Car Garage. This is the 1/24-1/25 Scale Plastic Model Vehicle Accessory Kit of the Scuff Pads Coarse (2) (D) by Model Car Garage. This is the 1/24 Scale Plastic Model Vehicle Accessory Kit of the 1998 Ford Taurus Grille & Duct Works (Photo Etch) by Model Car Garage. This is the 1/24-1/25 Scale Plastic Model Vehicle Accessory Kit of the Wingbat Billet Style Steering Wheel (2 Pewter Rims & Photo Etch) by Model Car Garage. This is the 1/24 Scale Plastic Model Vehicle Accessory Kit of the 1996 Thunderbird Stock Car Grille & Duct Works for Monogram 1996 Thunderbird NASCAR kits (Photo Etch) by Model Car Garage. This is the 1/24-1/25 Scale Plastic Model Vehicle Accessory Kit of the Stock Car Hood Tether Set (Photo Etch) by Model Car Garage. This is the 1/24-1/25 Scale Plastic Model Vehicle Accessory Kit of the Lowrider Chain Link License Plate Frame (8) (Brass) by Model Car Garage. This is the 1/25 Scale Plastic Model Vehicle Accessory Kit of the Custom Billet Style Chevy Pickup Truck Grille (Fire) for RMX Chevy Silverado (Photo Etch) by Model Car Garage. This is the 1/25 Scale Plastic Model Vehicle Accessory Kit of the Ford Custom Billet Style Truck Grille Black Widow for RMX Ford F-150 Pickup (Photo Etch) by Model Car Garage. 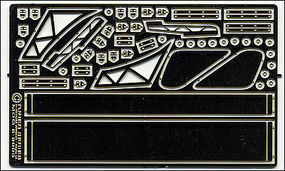 This is the 1/24-1/25 Scale Plastic Model Vehicle Accessory Kit of the 1995 Monte Carlo Stock Car Duct Grille Works (Photo Etch) by Model Car Garage. This is the 1/24-1/25 Scale Plastic Model Vehicle Accessory Kit of the Tuner Custom Billet Wings Wingbat GT .015 Nickel Silver (Photo Etch) by Model Car Garage.